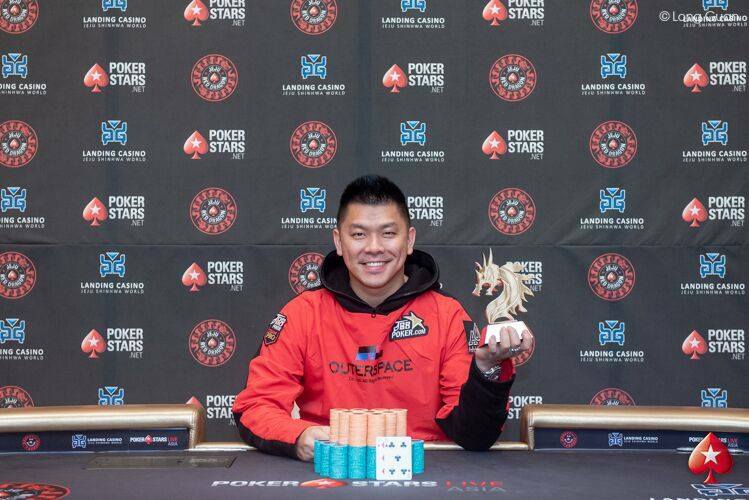 The buy-in of “JeJu RedDragon KnockOut Bounty Event”was KRW 400,000. The average chips of final table were only 12bb and my chips were a little more than the average. I found that the players on the table had a poor understanding of the hand range. They folded too much and did fewer betting and also were weak in blinds protect. It was a great chance for me. I did an aggressive play and actively attacked the blinds. It was when there were only four people left. I did all-in with my hand ‘A5s’, but the hand of big blind was ‘A4o’. I only left 7bb chips after I lost against the big blind. Then I got hand ‘A6o’ in big blind and called the small blind’s all-in. After winning the hand against small blind, I doubled up my chips. The most important hand was the chip leader did all-in in button position with hand ‘QKo’, and I called in big blind position with hand ‘A9o’ . The window card opened on the board was ‘K’ and the second card was ‘A’. After winning this hand, I doubled up my chips and became the chip leader. In heads-up, I did all-in with wide hand range. My chips were nearly seven times more than my opponent. My opponent was a careful player who comes from Mongolia. His play was very conservative but he was forced to call my all-in with hand ‘T6o’. My hand was ‘57o’ and the tournament ended with a ‘5’ dealt on the board!